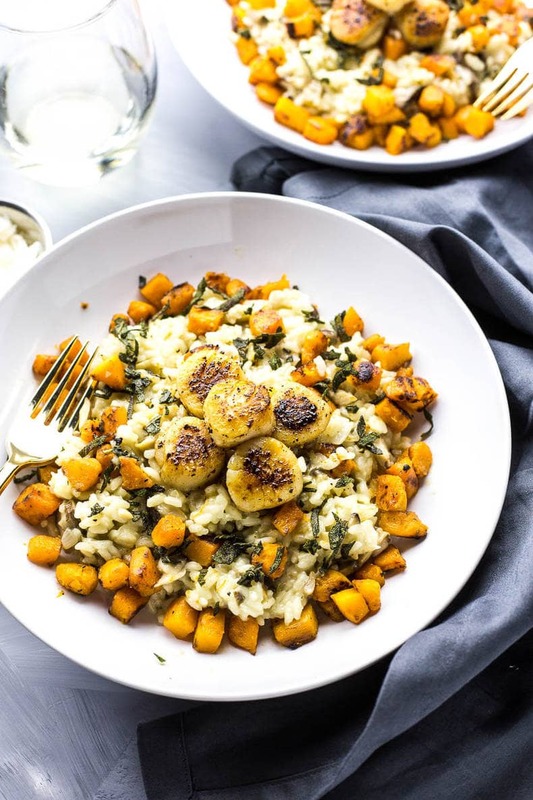 This Seared Scallops with Butternut Squash Risotto recipe is a delicious, indulgent dinner with roasted squash, crispy sage, parmesan & wild mushrooms! 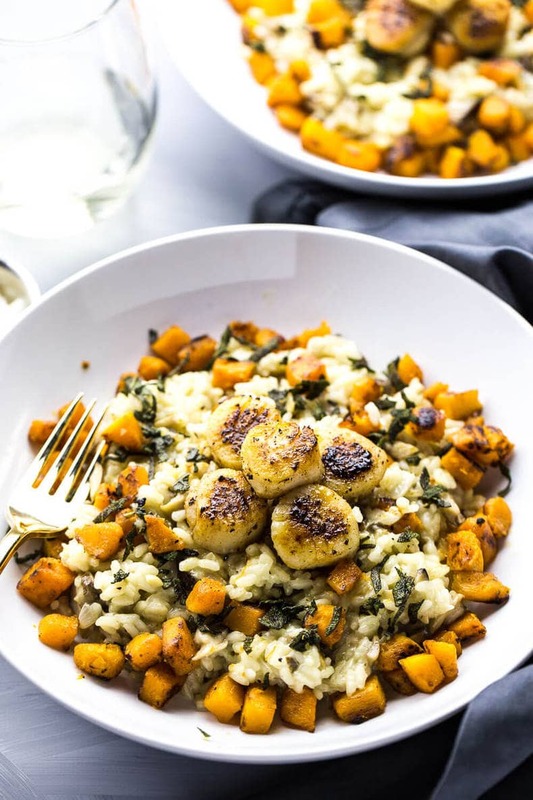 These Seared Scallops with Butternut Squash Risotto seriously make for the ultimate romantic meal. I've always been a steak, mushrooms, caesar salad and baked potatoes type of gal when it comes to special meals. Like, take me to a steakhouse and get me some flowers (or a big bottle of wine just sayin'…) and I'm a happy woman. Basically what I'm trying to say is that the way you get to my heart is through food. Fancy, expensive food that you can't really afford to buy everyday. Food that you would normally get at a fancy restaurant, that you make at home. Sometimes doing it yourself is WAY more fun than being waited on. Or being stuffed into a packed, overpriced restaurant. When I was in a relationship a couple years ago, the way we celebrated any special occasion was planning a glorious, fancy meal to enjoy together. We weren't big romantics or anything like that, but Valentine's Day was basically an excuse to get dressed up and do something fun despite the winter blues. Sometimes it involved heading out to one of our favourite restaurants in the city, but as all Canadians know well, February ain't exactly one of those months you wanna go out and hit the town hard. Especially in heels or a dress. It's friggin' cold out there! So sometimes as you can imagine, you can appreciate staying inside, lighting every single candle in your house, getting cozy over a few cocktails or glasses of wine and creating a delicious feast for two. Honestly, cooking with someone is one of my favourite ways to bond, right from the grocery shopping to the wine getting, to the creating of the dish. 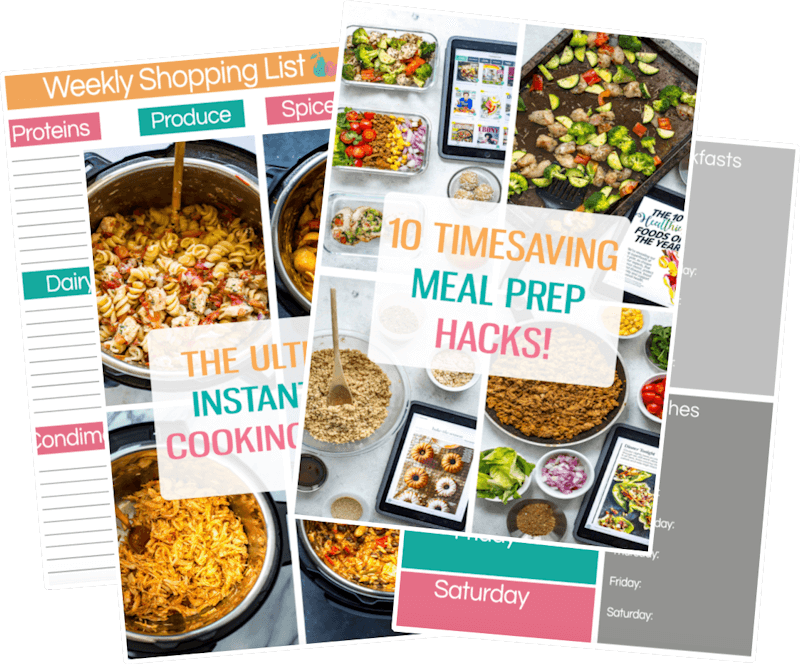 Put on some tunes, get away from the screens and just get into the swing of cooking together, laughing and having a ton of fun. Even though I cook for a living, I really adore those few Saturdays of the month where you plan a big meal with your loved ones – friends, signficant others, family, whatever – and just get to enjoy the process of cooking and being together while creating something special. 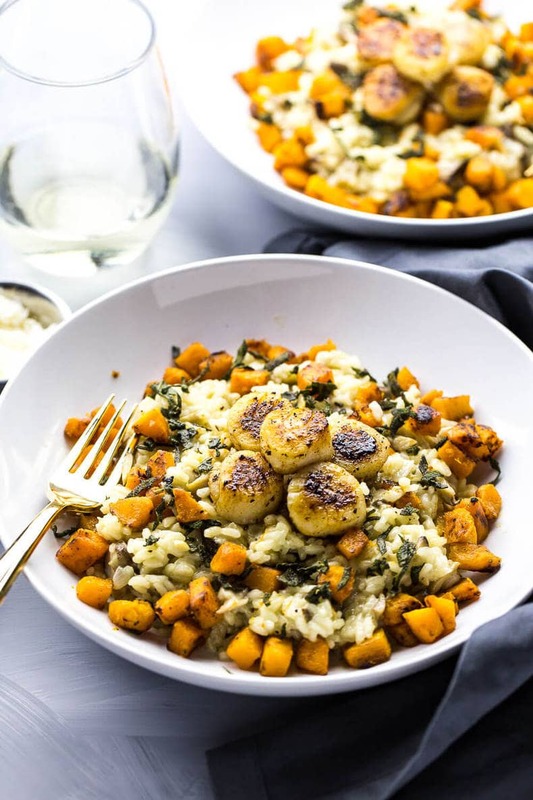 These Seared Scallops with Butternut Squash Risotto is seriously THE recipe you want to save for one of those special occasions – Valentine's Day or not. 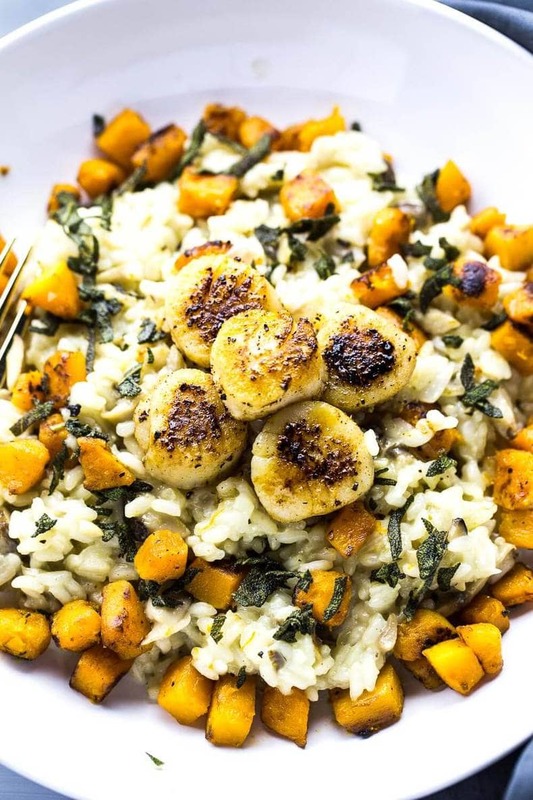 Really, risotto is fairly easy to nail. It's kind of a no-fail recipe just as long as you don't leave it unattended. 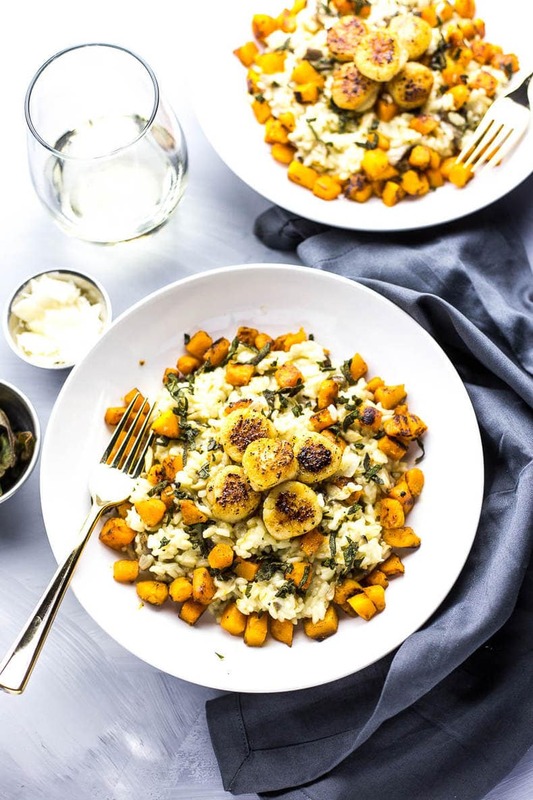 And the seared scallops may seem equally as daunting but I promise you that this part of the recipe is equally as easy to perfect. 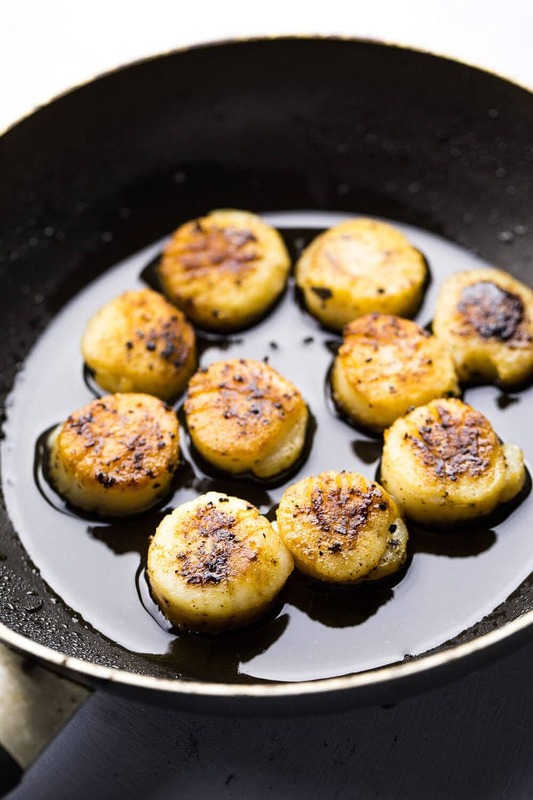 Lay them on a paper-towel lined plate to absorb excess oil, then serve them right away. Cooking scallops should literally be the last component of any dish, no matter what recipe they are in. They cook fast and you want to enjoy them while they still have the crispy outside sear! 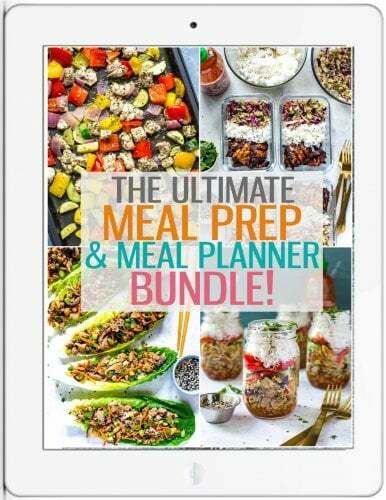 See, you've practically become a professional chef overnight with my tips, right? 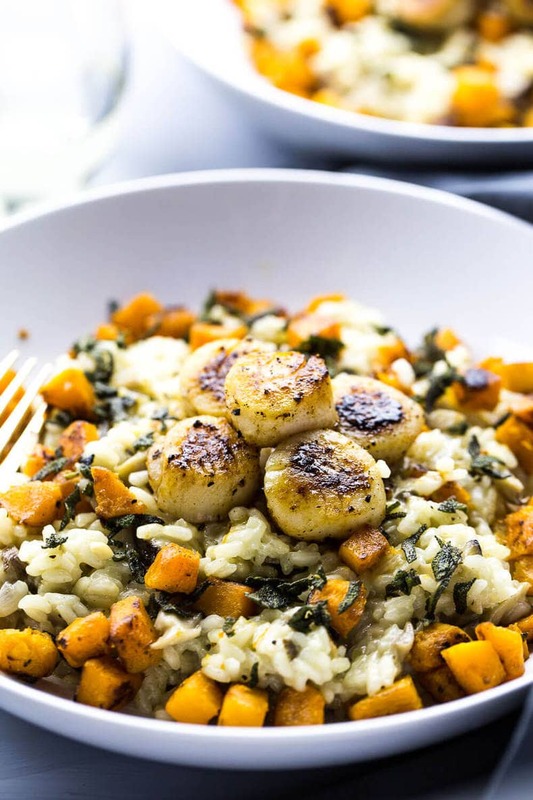 Will you be making these Seared Scallops with Butternut Squash Risotto? What are some of your favourite things to cook for special “love days” like Valentine's Day? I'd love to hear whether you're a scallops or steak person hehe. I consider myself both. The more food the better, right? If you try any of my recipes be sure to let me know on Instagram, Twitter, Facebook or in the comments – I’d love to see what you cook up! Preheat oven to 450 F. Prepare squash and toss in olive oil. Season with a bit of salt and pepper. Roast in the oven for 30 min, stirring a couple times. Meanwhile, melt 1 1/2 tbsp butter in a medium-sized saucepan over medium-high heat. Add mushrooms, shallots and garlic, sauteeing for 4-5 min. Add dry rice and stir. Add wine and bring to a boil, then simmer for 4-5 min until wine reduces a bit. Add stock, about a 1/2 cup at a time, stirring enough to keep the rice from sticking to the edges of the pan. Don't ever stop stirring the rice, it will start to turn creamy as stock absorbs. When the stock is almost completely absorbed, add the next 1/2 cup until finished. The rice should be al dente. Remove from heat and stir in parmesan cheese. Add salt and pepper and keep warm on low heat. In a small frying pan, heat olive oil over high heat. When oil starts smoking, add scallops to the pan, searing for about 1 min each side. They should develop a good sear on either side. Remove scallops from pan, and wipe pan clean. Lower heat to medium. Add about 1/2 tbsp butter and once melted, add chopped sage. Saute for about 30 seconds to a minute until crispy. Remove from pan. Serve risotto in pasta bowls. Top with roasted squash, crispy sage and seared scallops. Enjoy! Sea scallops are one of my favorite things in life! 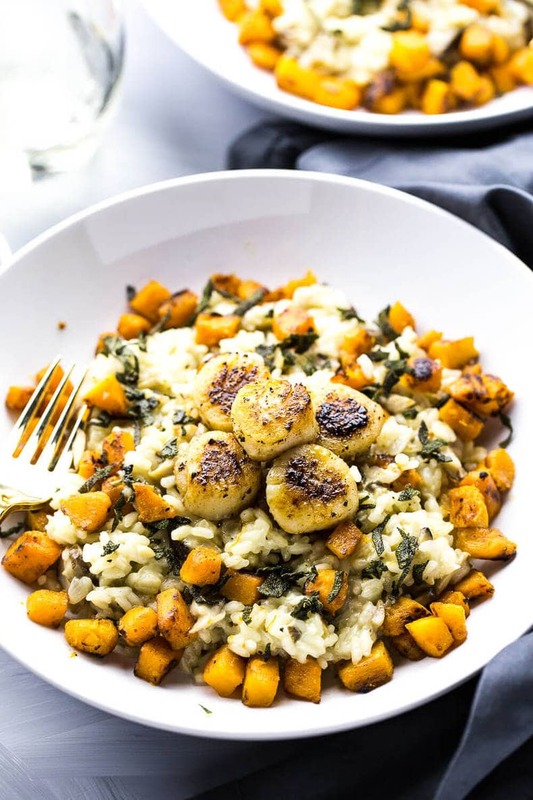 Gorgeous sear on those scallops and the risotto looks and sounds mouthwatering! YUM! Nothing wrong with a good seared scallop! 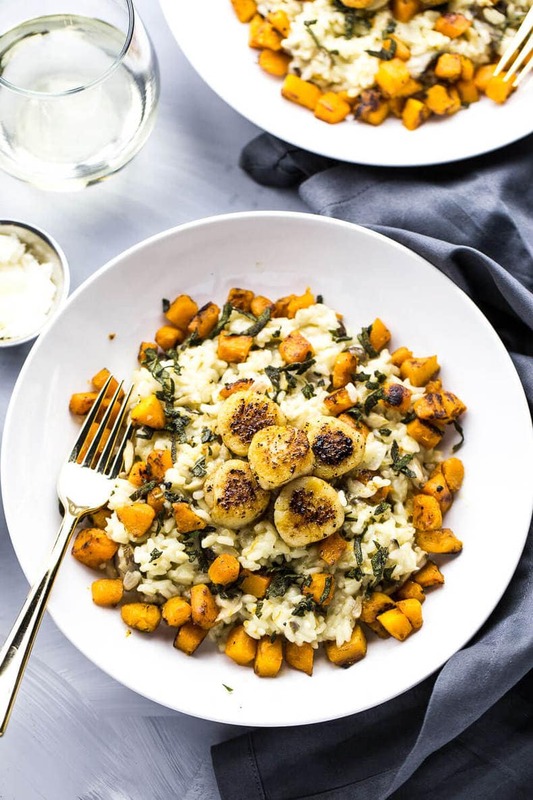 Great risotto tips as well, look forward to trying these both, thanks for posting. See ya’ in the twitterverse sister!